Prepare macaroni according to box directions. I recommend only using 2 Tbsp. butter instead of the recommended 4 Tbsp. While macaroni is cooking, brown the ground beef. Drain excess grease. 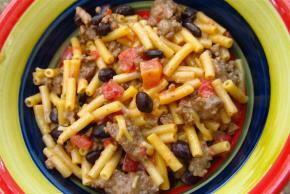 Add ground beef, black beans, Ro*Tel, chili powder, and cumin to macaroni and cheese and stir.